White water brings out the smiles and the spray. Rafters take time out of the boat for relaxing in the sun-warmed eddies. 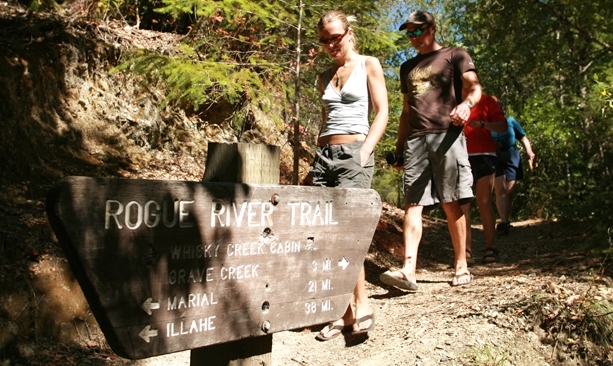 The Rogue River Trail offers 40 miles of hiking through lush woods along the great river. 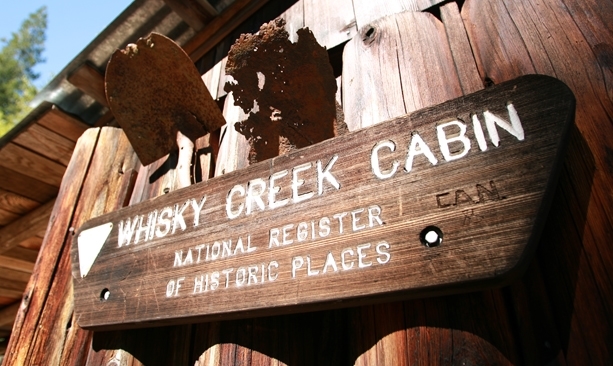 Whiskey Creek Cabin was a miner’s home in the 1880s and has a solar-powered shower and a water-wheel used to generate electricity. 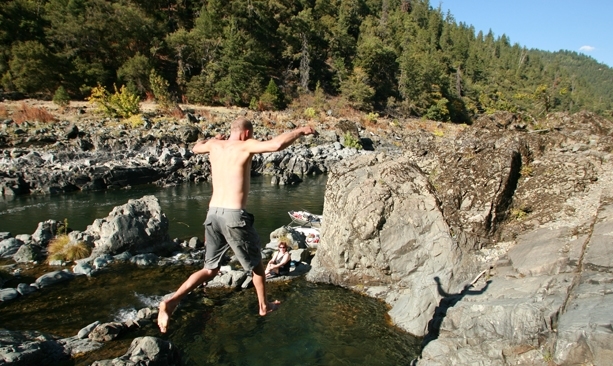 The Rogue was one of the first eight rivers to receive the Congressional designation of “Wild and Scenic” when that law was first enacted in 1968. 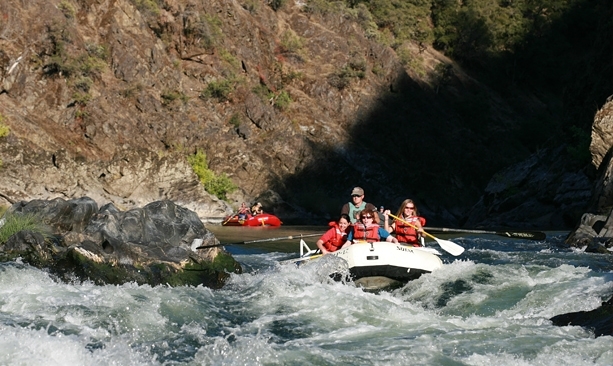 The raft offers access to the natural beauty of the water, river canyon and wildlife. Riverside lodges know how to throw out the welcome mat. Hospitality, good food and great company are served in full portions. 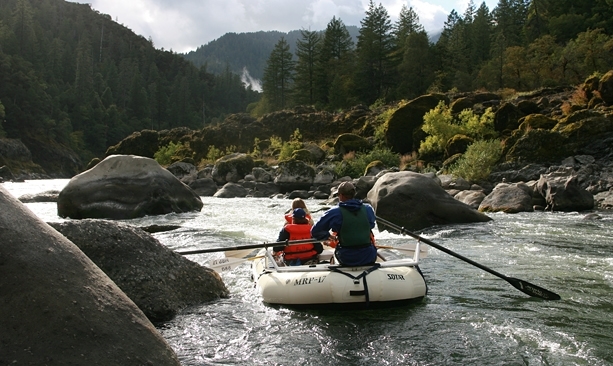 The Black Bar Lodge is located 9 miles into the Wild and Scenic section of the river. 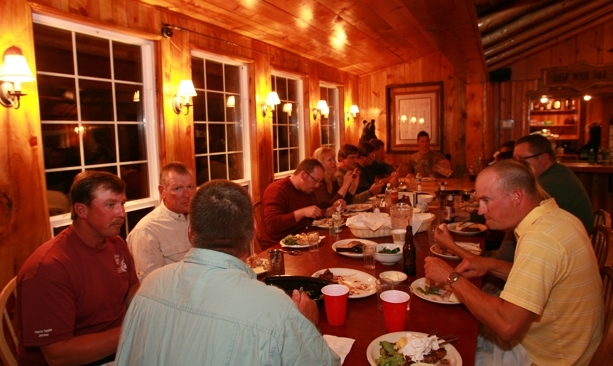 Old friends and new gather at family-style meals. Hmmm … Though I figured that my river-rafting companions would be pleasant, even delightful, after 54 hours and 40 miles downriver in each others’ company, did we really need to share brewskies at some pub called Foster Bar? After all that time together, what would be left to say? Correction. “Bar,” it turns out, is a ridge of sand or gravel formed by the action of currents. We were ending up at a beachhead, not a tavern. 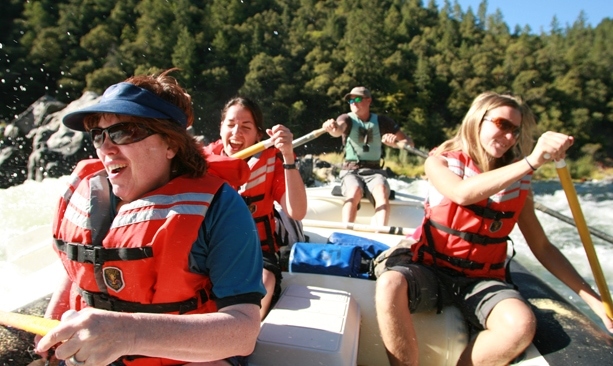 This seemed to prove that I am, indeed, an utter novice in the river rafting game — literally wet behind the ears. 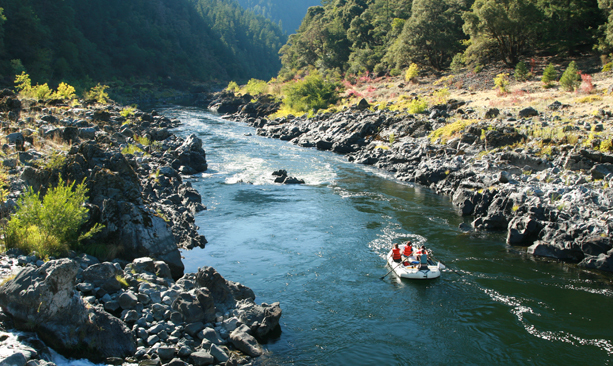 Upon further study, I realized that the Rogue River isn’t just your average 215-mile river starting at Crater Lake in Southern Oregon and ending at the Pacific Ocean; it was one of the first eight rivers to receive the Congressional designation of “Wild and Scenic” when that law was first enacted in 1968, entitling it to certain environmental protections. Even more exciting, my particular rafting trip would journey through the 33.8-mile area that was deemed “Wild.” Was I up for a date with a Wild Rogue? You bet. We arrive at the designated put-in spot at 9:30 a.m. on a sunny summer morning in Argo. Immediately following warm hellos, my worldly goods are transferred into dry bags. River guides Bryan and Chris patiently strap me into a life jacket, though I protest that the vest’s particular shade of orange is not my best color. Perhaps they have something in a form-fitting navy? Tall, teddy-bearish Chris chuckles, as if he’s heard it all before. We then clamber into the boats (Hey! How did I get the front seat?). The sun warms my skin, the sky is robin’s-egg blue, and the water is like a mirror, reflecting the surrounding hills of fir, aspen and wild dogwood. Other than the sound of the paddles, it’s extraordinarily quiet. 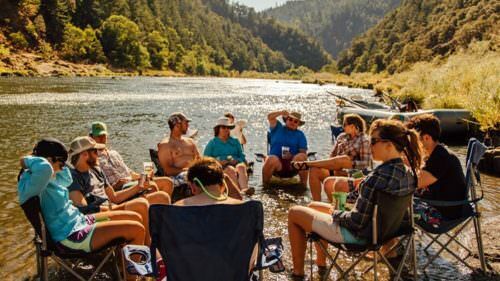 With only a limited number of people allowed on this Wild and Scenic River on any given day between May and October, the sound of silence overwhelms. I take to the art of paddling very well, or so I think, until my seatmate informs me that I’ve hit her with my paddle. Twice. I try to blame the bulkiness (and color) of the vest, but she’s not buying it. I concentrate harder, especially with the first Grave Creek Rapids approaching. “All forward paddle!” Bryan commands. But between making futile attempts to dodge the wall of spray, and Homer Simpsonian howls of “Whoo-Hoo!” ripping from my diaphragm, my paddling takes a back seat. Which is where Bryan sits, still commanding that we paddle. So much for the river’s overwhelming silence. After the first shock, dripping and giggling, we regain our composure as Bryan describes Old Man Rainie, who made his living gaffing salmon here in the early 1900s, spearing the fish as they leapt upstream in the steepest of falls. This 12-foot drop, “Rainie Falls,” is too treacherous for river-rafting guests to ride, so we find ourselves on shore watching Bryan, River-Guide Extraordinaire, steering effortlessly through the swirling, rocky whitewater. 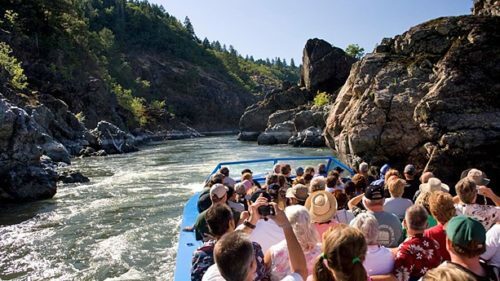 Other than impressing us time and again with his skill maneuvering the rapids, rowing within a hair’s breadth of high rock walls, then expertly deflecting the craft, our guide is a modern day Will Rogers, an anecdote-spoutin’ Southern Oregonian with a sharp brain and a sly humor. We are plied with wonderful stories about his hero, Glen Wooldridge, first successful navigator of the Rogue in 1915, who altered the river’s geography with liberal usage of dynamite, who improved the technical capabilities of riverboats, and who was the celebrity guide for the likes of Ginger Rogers, Clark Gable, Herbert Hoover, Betty Grable and Zane Grey. Other reasons to land onshore are the earthly delights of food and shelter. Lunchtime is a treat with a buffet-style picnic, sandwich deli meats and cheeses, and Tina Hughson’s veritable boatload of fresh salads (fruit, vegetable, pasta), cookies and buttermilk chocolate cake/brownies. With our rafts and inflatable kayaks parked on the bank, all of us lolling on comfy beach chairs gazing out, while blue herons, osprey and turtles gaze in. Lunches are absolute paradise. After a day on the river, the lodges throw out the welcome mat. First night, it’s Black Bar Lodge with stand-alone pine cabins nestled among the trees. At dinnertime, the table groans under the thick steaks, pastas and salads. Early the next morning, thermoses of steaming hot coffee are delivered right outside each cabin door, heralding a breakfast replete with fried eggs and ham, fluffy pancakes and fresh fruit. 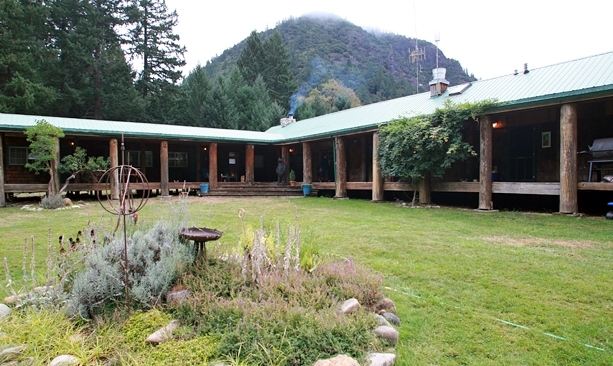 Second night, we pull up at the historic Paradise Lodge, situated just below the Class IV rapids of Blossom Bar. Mia, a miniature pinscher mix, trots out to give us all a heartfelt hello while her best friend Izzy — a long-haired terrier/dachshund combo — brings up the rear. The other critters who populate the scenic grounds, including deer, owls, eagles, aren’t quite as effusive. Mia and Izzy might want to consider giving them some hosting tips. Between Paradise Lodge’s 6,000-square foot deck overlooking the Rogue, skylights embedded in the dining room’s vaulted ceiling and “wilderness gourmet” feasts served family style, featuring ribs, chicken and fresh vegetables harvested from Paradise’s own garden, this is luxe for the river. Heck, it’s luxe for anyplace. 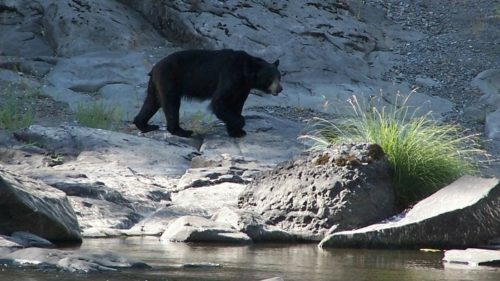 The memories linger: the ouzel’s haunting “come-play-with-me” call, echoing off the resonant rock walls of Mule Creek Canyon; the thrilling drop pool rapids; the sight of a black bear cub playing peek-a-boo from the shore; the company and above all, the ever-changing, magnificent Rogue. I agree. So when are we all going to meet for beers at Foster Bar?